← Project Management Decisions – Logical or Emotional? I had the honor of speaking with a wounded warrior today. His name is Nelson Holman and he’ll celebrate his 93rd birthday in October 20th. He sustained his wounds on December 7, 1941, while serving on the USS Pennsylvania at Pearl Harbor, Hawaii. He is confined to a wheel chair, and although his body is frail, he has a firm and friendly hand shake and speaks with a clear voice. His short-term memory sometimes falters, and he often re-greets and re-thanks those he just met a few minutes before, but his memories of that Sunday morning in December of 1941 are vivid and precise. He told of seeing the faces of the Japanese pilots as they flew their planes over his ship. He remembers seeing the torpedoes slung beneath the planes, and then seeing them drop into the water and watching the white trail of bubbles that followed them to the ships that they struck. He said he was at the guard post next to the ship when the raid started and the General Quarters alarm was given. Running up the gang plank to the ship, he made his way to his battle station, a gun which unfortunately had a barrel that couldn’t be depressed enough to use against the low flying attack planes. As the torpedo planes dropped their weapons, other planes began strafing and bombing runs. It was the explosion of a bomb in a nearby ships compartment that killed many others, and injured him, breaking his legs and wounding him in the back. He managed to crawl out of the debris to reach rescuers who braved machine gun fire to carry him to an ambulance. As he described these scenes he stared straight ahead into space as if watching the horror on a screen. And as he continued speaking, his voice gradually become softer and more hesitant, and then stopped and he ended his story with a sigh and a shake of his head. He said it was bad, really bad. I lost a lot of friends that day. Meeting Nelson today inspired me to write a poem to pay tribute to the sacrifice and courage of all wounded warriors. And with respect sir, I disagree. 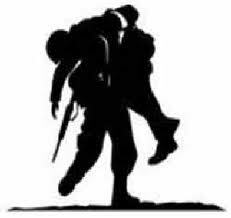 This entry was posted in Heroes, poetry, That's Life and tagged Heroes, poetry, Wounded Warrior. Bookmark the permalink.